the Charities Commissioners have taken a dim view of an FoE leaflet that claimed that silica – that’s sand to you or me – used in fracking fluid was a known carcinogen. Phil Clarke’s comments on the hosts book are an insight into the Green Activists. So you’ve read HSI, then? I have a reading backlog of far more worthwhile volumes, fiction and non-fiction. Does anybody dispute a single point in Tamino’s adept demolition? Where did I slag off HSI? I simply trust Tamino; the point about innuendo certainly rings true, based on other writings. Tamino’s article was responded to twice by Steve McIntyre. The first looks at the use of non-standard statistical methods and Re-post of “Tamino and the Magic Flute” simply repeats the post of two years before. Tamino had ignored previous rebuttals. A simple illustration is the Gaspé series that Tamino defends. He misses out many issues with this key element in the reconstruction, including that a later sample from the area failed to show a hockey stick. So Phil Clarke has attacked a book that he has not read, based on biased review by an author in line with his own prejudices. He ignores the counter-arguments, just as the biased review author does as well. Says a lot about the rubbish Cuadrilla are up against. Bishop Hill posts on a You-tube video “13 Misconceptions About Global Warming” from Veritasium (Dr Derek Muller), inviting readers to play a sort of bingo to “spot all the strawmen arguments, cherrypicking, out of date data, and plain old mistakes”. Here is my attempt, restricted to just 13 points. “Global warming” / “climate change” naming. It might be true that people can deny global warming by pointing to a localized cold weather snap. But it is also true that using the term “climate change” can result in any unusual weather event or short-term trend being blamed on anthropogenic global warming, along with natural global fluctuations. The term “global warming” reminds us that the adverse effects on climate are as a result of rising greenhouse gas levels warming the atmosphere. More importantly the use of the term “global” reminds us those changes in climate due to changes in greenhouse gases is a global issue requiring global solutions. Any mitigation policy that excludes 80% of the global population and two-thirds of global carbon emissions, will not work. Veritasium claims climate change is also about more extreme weather and ocean acidification, not just the average surface temperature is warming. But there is nothing in the greenhouse gas hypothesis that says a rise in temperatures will result in more extreme weather, nor does Veritasium provide the evidence of this happening. At Wattupwiththat there is a page that demonstrates weather is not getting more extreme from a number of different measures. Claim that it has not stopped warming as 13 of the 14 hottest years are in this century. This is a strawman, as there was significant warming in the last quarter of the twentieth century. We would only fail to have hottest years if global average temperatures had taken a sharp step decrease. Claims that taking the satellite data of global temperature anomalies into account shows that warming has not stopped. From Kevin Cowtan’s page (copied by Skeptical Science) we can calculate linear trends. It is the RSS satellite data that shows the longest period of no warming – 18 years from 1997-2014 based on the linear trend. It is just 13 years for GISTEMP and 14 years for HADCRUT4. The other satellite data is UAH, where there is just 6 years of no warming. What he is doing is comparing UAH satellite data that only shows the pause from 2009. There is now 35 years of satellite data, with the total recorded trend of 0.48oC. The RSS data shows 0.51oC of warming. The surface thermometer measures vary between 0.59 and 0.63 oC of warming. This is data cherry-picking. 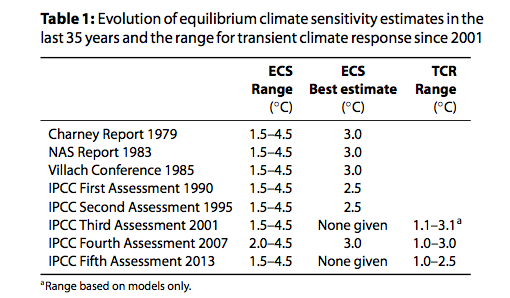 Claims the central estimate for warming from a doubling of CO2 is 3.0oC of warming. Based on this from 2001 from HADCRUT4 shows no warming there would be 0.30oC of warming, when the trend from HADCRUT4 is zero. In a longer period from 1979 for which we have satellite data, an increase in CO2 from 336.8 to 398.5 ppm (Mauna Loa data) implies an increase in temperatures of 0.72oC – between 1.14 on 1.5 times greater than that measured by the temperature series. Even this is misleading, as there was no warming from 1944 to the late 1970s. In 1944 I estimate that CO2 levels were 308ppm, indicating a total warming in the last 70 years of 1.1oC, respectively 1.7 and 2.1 times greater than the trend in GISTEMP and HADCRUT4. This would appear to contradict this graph, which has no proper labelling showing have 3.0oC of doubling affects temperatures. Specifically from 1958 to 1980 CO2 rose from 315 to 339ppm, indicating warming of about 0.31 oC, but there was no warming in the IPCC projections. A rise in CO2 of 315 to 398.5 ppm from 1958 to 2014 would predict 1.0 oC in warming, almost double the actual data and the IPCC projections. Another point is with the “observed temperature”. It is not identified (probably GISTEMP) and ends on the high of 2010. Completely ignores the other greenhouse gases that contribute to warming, such as methane and halocarbons. Claims that sea level rise is another indication of global warming, through thermal expansion. This is not necessarily the case. The average temperature of the ocean is 3.9oC. A rise of to 4.0 oC will have zero expansion. If the rise in sea temperatures is confined to the Arctic or in the deep oceans where temperatures are below 4.0 oC, a rise in temperatures would mean a fall in sea levels. Below I have compiled a graph to show the expansion of a 100metre column of water by 0.1 oC from various starting temperatures. On Arctic Sea ice, is correct in saying that the 40% uptick in the last two years ignores the longer period of data. But in turn, Veritasium ignores evidence pre-satellites that were fluctuations in sea ice. Further, the uptick occurred at precisely the year when previous experts had predicted that summer sea ice cover would disappear. As a consequence, contraction of the sea ice is both less severe and less likely to be linked to human-caused warming than previously thought. Correctly points out that water vapour is the major greenhouse gas, but incorrectly claims to have evidence that water vapour is increasing in the atmosphere. The evidence is from a graphic from a 2007 PNAS paper. The evidence from 1900 is the average of 12 models. The confidence intervals are utter rubbish, appearing to be related to the magnitude of the average modelled anomaly. The actual (estimated) data in black does not have a confidence interval. It would appear that this estimated data has a step increase at roughly the time, or slightly before, when the warming stopped in the surface temperature records. Policy justification is totally wrong. I’m not claiming it’s going to be some sort of crazy catastrophe, but we are going to get more intense storms, more droughts and floods, the oceans will become more acidic, sea levels will rise and my point is it would be better for all species on this planet and probably cheaper for us if we just started reducing emissions now than if we wait and pay the consequences later. Every economic justification of policy projects “some sort of crazy catastrophe” that human being and other species will not be able to adapt to. Further they project that global emissions reductions will be both effective and relatively costless, which is contradicted by the evidence. But most of all, there is no political proposal in the climate talks that will reduce global emissions in the next twenty years. The proposals may only constrain the rate of increase.